Digital photos by Zhenya Olenchuke. Thanks Zhenya! "Excuse me sir, but is that a rocket in your pocket?" This is a fun little rocket that uses the tiny Quest MicroMaxx motors to loft a Bic(R) pen over 50' in the air and land by Parachute. I wanted to design my own MicroMaxx powered rocket but couldn't find a good material to use for a body tube. I was just getting ready to roll my own tubes when I noticed that the pen I was holding was about the right size. This particular brand of pen, the Bic(R) "Round Stic(R)" has a 5mm inner diameter, and is a perfect fit for the MicroMaxx motors. It is a bit heavy but is very strong. As an added bonus, the other parts of the pen supply the majority of the building materials for the rest of the rocket. 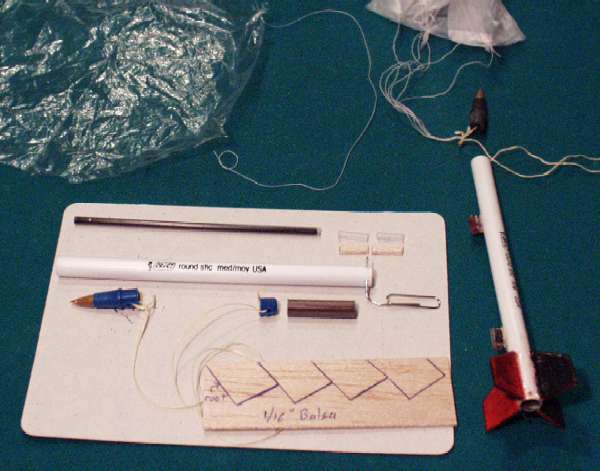 This rocket was designed and built in one evening and flown two days later. The fin design was just off the top of my head and seemed like a good shape for maximum strength given the thin balsa. It is similar to a WAC Corporal shape although I chose to use four fins instead of the WAC's three. Later I realized that the rocket looked a lot like the HV ARCAS sounding rocket so I renamed this design the Bic(R) ARCAS. It's first flight was on 10/22/00 with near-perfect results and great chute deployment but the sewing-thread shock cord failed. 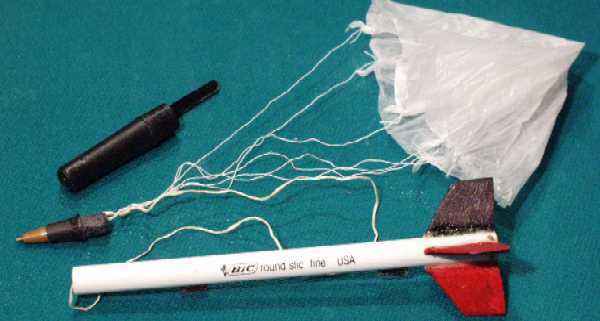 The next flight, with new and improved kevlar shock cord, was at the Blaine, MN MASA launch on 10/28/00 with perfect launch, flight, deployment, and recovery. This will be used in step 5 to construct the motor thrust ring and shock cord attachment poing. (this will give more room for the chute and make the nose cone eject more easily). 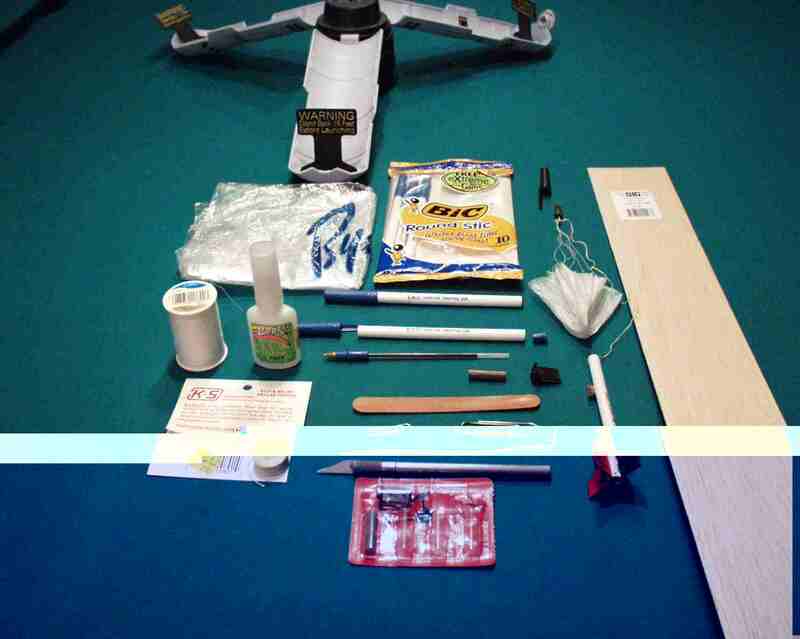 Cut it using a sharp razor knife by rolling the cone under the knife against a table top (protected by cardboard!). Save the remaining ring for use as the motor thrust ring in step 5 if the end plug was not salvagable from step 1.
b. Note: this step can be messy: Cut off the ink tube from the tip, leaving about 1/4" so the pen still has some ink left to write with. c. Plug end of ink tube that is still attached to the tip with a spike of tissue and soak the tissue with CA glue. Spray it with CA accellerator/kicker if you have some. This should keep it from leaking. d. Cut off and save the clear part of the remaining ink tube and carefully discard the ink-filled portion. 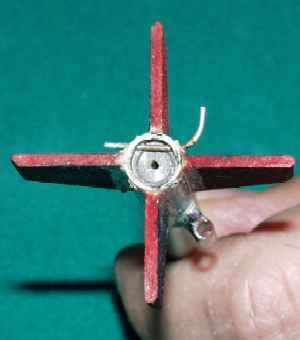 e. Drill small 1/16" hole in middle of shoulder of cone using knife tip or drill bit. f. Carve small groove from hole to end of shoulder so shock cord will not be pinched. h. Reinstall the pen tip into the grip. a. Mark the fin alignment lines on the body tube. three equally spaced 120 degree marks on the end edge of the body tube. 5. Rotate the body tube 120deg and make another line. repeat for 3rd fin. tube to a bit forward of the mid-point. a. Use tip of razor knife, or small drill bit to make two 1/32" holes each 1/16"
sides of a fin line, opposite of launch lug. fall out on its own, yet can be inserted and removed fairly easily. area of the motor. If it is too close, try again on another part of the tube. ejection charge from blowing the motor out of the rocket. e. Remove retainer wire for next step. a. Cut a 1/4" cylindrical section from the pen end plug, discard flat part of the plug. a 1/4" loop so the knot will not interfere with fit of ring. paper clip or long dowel) until it is approx 1/2" from AFT end of body tube. body just clearing the motor retainer clip holes. retainer clip. There is no need to glue the ring in place. without disturbing the thrust ring, then replace the clip. a. Cut two 1/4" pieces from the clear part of the ink tube saved from step 2d. to get CA on your fingers. of the pen tube. One at the mid point, and one 1/2" up from the aft end. be parallel with the swept leading edge of the fin for maximum strength. rounded or pointed shape. Sand root edges flat. minute or two before proceding to the other fins. some accellerator to make an acceptable fillet. thirds and make one cut 2.5" from apex. small chute so I just tie the line directly to the corners of the plastic. 4. attach other end of shroud line to adjacent corner using same method. end of the combined shroud lines to form a 1/2" loop. line loop, gently pull tight while ensuring all lines are straight. Before launching this rocket, make sure that it will be stable so it doesn't fly into people. This design has been well tested and if the instructions are followed exactly it will be stable. other thin object. Mark this point on the body tube with a pencil. sideways and verify that it quickly rotates to a nose-first attitude. aft. There is not a convinient way to add nose weight to this type of design. weight to the nose but hurt performance. b. Install MicroMaxx motor (verifying it is nozel end down), until recessed past retainer clip holes. way into the motor, just until wadding contacts motor thrust ring. with all lines taut in center and the material neatly arranged. 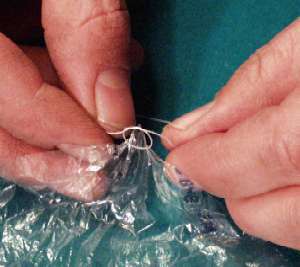 d. While keeping taut, gently sqeeze sides of chute into a thin cylinder shape. Do not fold or roll, just sqeeze. the chute lines and chute. is able to slide back out easily. down far enough to leave room for lines and nose cone. out. This is difficult, especially since Kevlar shock cord is springy. b. Place over launch rod on MicroMaxx pad. e. Recover the rocket. Note, the engine and retainer clip may be hot. cardboard paper towel tube or small box. Build more with different designs. Make sure to test them for stability using the twirling method before launching a new design. This project was so successful that I plan to develop other designs around this concept. "Bic" and "Round Stic" are registered trademarks of the MM Bic Corporation, Milford, CT. Bic Corporation does not own or market these rockets, their name is used purely to accent the source of some of the rocket's components. Designs copyright (c) 2000 by Jeffrey P. Hove, all rights reserved. 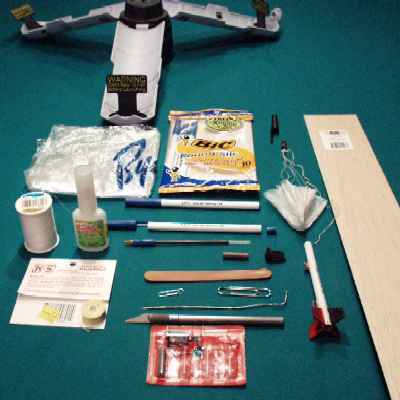 Non-commercial use granted provided credit is given and this web page is linked to any on-line display of rockets derived from these techniques. I reserve exclusive rights to negotiate with Bic Corporation regarding advertising use of the Bic rocket idea.